The General Air Pollution Control Barrels are ready to use, low cost, self-contained air purification adsorbers designed to treat airflow streams of up to 250 CFM. The units are available in four different sizes to better serve your treatment applications. Activated Carbon – The Air General vapor adsorbers are filled with virgin, high activity, activated carbon. Any of virgin coal, coconut shell, reactivated or impregnated carbons are available as well. Removable Lid – 16 gauge lid with ring and bolt closure, poly-clad cellulose gasket. Connections – Metal connections with standard pipe threads insure easy, durable and leak- proof hookup to your system. Unions or quick connect fittings are advised to make drum exchange easy. Drains let you remove any accumulated condensate. Flow Distributors – The 55 gallon barrel uses an air chamber to ensure even distribution of the airflow through the carbon. Low-pressure drop slotted Schedule 40 PVC collectors are used in the 85 gallon and 110 gallon drums for proper flow distribution. Stainless Steel internals and drums are available for special applications. Coatings – The Air General pollution control barrels are coated on the inside with heat cured phenolic epoxy. The outside coating is industrial enamel. A polyethylene liner is available for extra corrosion resistance for the 55 gallon and 85 gallon units. Installation and Startup – The General air pollution control barrel requires no special procedure for startup. Just connect the inlet and outlet to the treatment system and start it up. Multiple units are usually connected in series with testing advised between the units to determine when the first unit needs to be changed out. 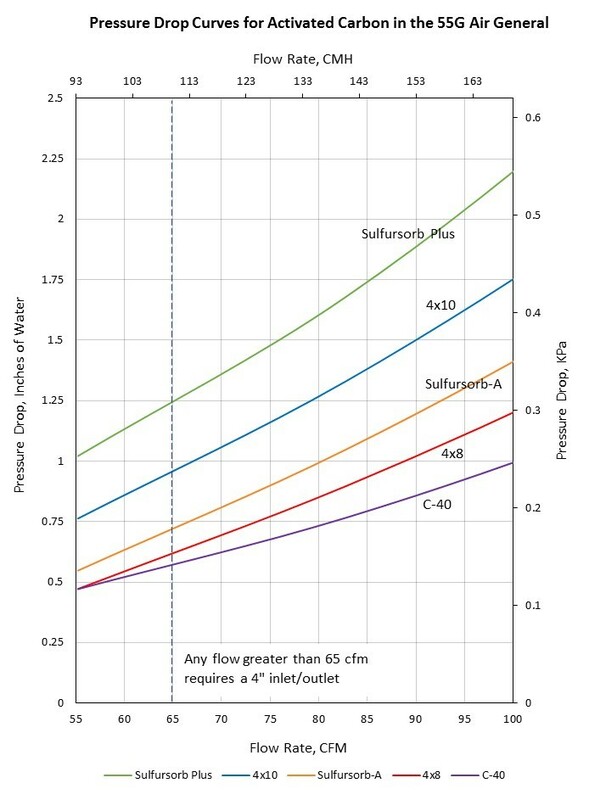 Maintenance – Once connected, The Air General requires no maintenance other than the monitoring of the influent and effluent air streams and the operation pressure of the system. Monitoring the air stream into the last Air Pollution Control Barrel in series mode is a recommended safeguard against breakthrough in the final discharge. 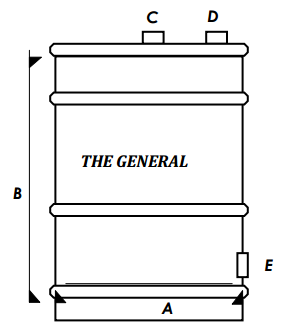 When the concentration of contaminants in the outflow equals the concentration in the inflow, The General has reached its removal capacity and should be removed from service. The working life of each adsorber is dependent upon the type of contaminant in the air as well as its concentration and the airflow rate. A pressure relief device is advised to prevent damage to the canister in the event of excessive pressure buildup. Recharging The General – Once the carbon has reached its pollutant removal capacity, the unit should be removed and replaced with a fresh one. To purchase replacement carbon or to arrange for a carbon change out, please contact our office. Wet activated carbon removes oxygen from air causing a severe hazard to workers inside carbon vessels. Confined space / low oxygen procedures should be put in place before any entry is made. Such procedures should comply with all applicable local, state and federal guidelines.